Tulsa Tech (Oklahoma) offers a course in masonry as an entry level course, often taken by new college students. Every year a few weeks before the anniversary of the attacks on 9/11 the students build a small memorial. This year the students built an 8 ft by 10 ft wall featuring the numbers 9 and 11 (11 symbolizing the two towers) with American Flag accents. The memorials every year are open to students and faculty and the memorials are constructed and left in the masonry classroom. Every year, visitors become emotional as they remember that tragic day in American History. A few things make this incredibly interesting. For one, many of these students were very young when the towers fell (and soon, young students will not have been born when this event happened). The instructors are making sure these students never forget what happened and that they respect how difficult it is to construct any building, even a small memorial without proper training. Not only is Tulsa Tech teaching history and respect for those who have fallen, they’re teaching respect for a trade that serves many purposes. Masonry is art; these memorials tend to make visitors cry more than any television memorial or professionally build reminder. These young students are in an entry-level masonry course. They don’t spend the entire course writing notes, watching videos, and making small models with legos or something. They are thrown straight in there and the results of these memorials year to year are amazing. The students must designate roles and learn the craft quickly enough to produce a product in a matter of weeks, from start to finish. Last year, the students creased an American flag from colored bricks. 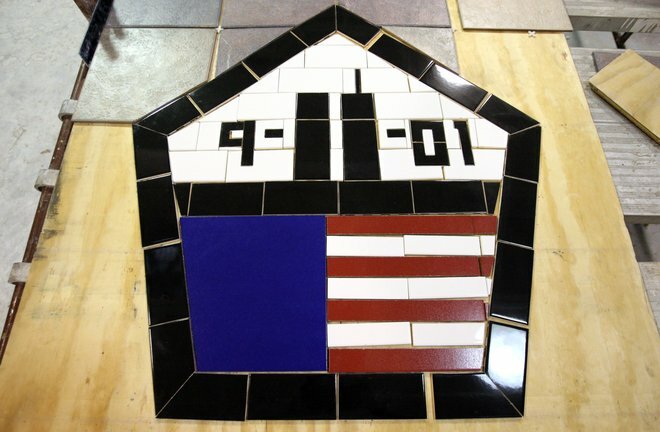 In 2012, it featured colored tile, mosaic style centerpiece, and multiple types of stone. 2010 featured two different tributes since there was a day and evening course. One was a tribute to the fire department of New York with a basic brick flag pattern background while the other focused on the actual towers. Both featured black and gold towers. The main thing these memorials have in common is the presence of the 9-11 date and a sense of patriotism. Masonry is a trade as old as time itself, but the uses for it keep growing. Memorials, businesses, homes, and more can be created from stone, brick, tile, and mortar. These kids prove that passion can move mountains. Their hard work, dedication, and respect of our history makes these a wonderful sight, regardless of their skill level. Some are particularly awe inspiring while others are less physically impressive or detailed but filled with emotion, respect, and remembrance. Never forget.